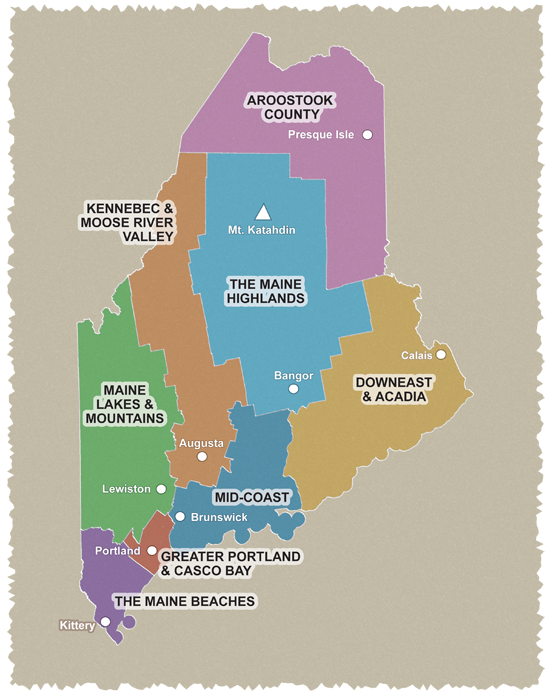 From endless forests and blueberry barrens to the craggy coastline, these rides take you on the roads less traveled in beautiful Washington County, Maine, the easternmost county in the United States. In fact, the first rays of morning sun strike the continental United States at Quoddy Head Light, a stop on two of the loops. Washington County celebrates a diversity in its landscape that is greater than that found in any other county in Maine. If you have the time, combine your bike trip with a hike on the Cobscook Trails in the Bold Coast region. The scenery from the rocky headlands is dramatic. There are campsites located on the shore approximately 6 hiking miles from ME 191. The 20-mile loop takes you from Machias to Roque Bluffs State Park for a picnic or a swim in either fresh- or saltwater. The 34-mile ride starts in Lubec and goes directly to Quoddy Head State Park. An option is to make this an international tour by crossing the International Bridge to explore Campobello Island in New Brunswick, Canada. The 36-mile ride starts and ends at the West Quoddy Head Light parking lot. Road conditions: No shoulders on ME 191. Wider road bike tires are recommended for these rides. If you plan your own trip, use extreme caution in planning any trip on ME 189, a road with considerable traffic. Pre-planning information: Be sure to carry an adequate supply of spare parts; there are no bike shops in the area. Other basic services are available except on the stretch from Lubec to Cutler, so carry water, food, and warm clothes. Be sure to bring your passport in case you want to visit Canada and return. Cautions: Some roads with no shoulders. Starting point: Each ride begins at a different location. The 20-mile ride begins at the public parking lot on Main Street in Machias behind the hardware store next to the Machias River. The 34-mile ride begins at the municipal parking lot on Water Street near the Campobello Island Tourism Assoc. building. The 36-mile ride begins at West Quoddy Head Light parking lot.